Howdy, Heh heh, Yukon! Kev! Howdy, Fee Fi Foe Fum... Kev! Howdy, Ain't too much badder than the wings of the clown.... Click to zoom, Kev! Howdy, Game pieces, anyone? Click, Kev! P.S. @VolksFest, Thanks for the idea! Howdy, For my twenty-ffifth day of International Mini Painting Month I present Karnon, Hero from the Descent JitD(2) expansion Shards of Everdark... The Dark Skin triad was used on this model, Kev! Color for rope/string, picture attached. I am painting a mini for my Descent 2nd edition game. I am fairly new to painting and I cant come up with a color for painting rope. 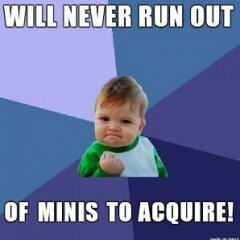 I've ran into this problem on a couple of minis. By looking at the picture where the light is not reflecting it looks kinda gray but I feel like it may not translate onto the mini. Anyone got any recipes or suggestions for rope.